This is an exceptional integrated amp from the Arthur Steidinger Company (ASCO). You can find more information about the outstanding power amp section on its own site (click here). The preamp section and the power amp are mounted on two different chassis and a multi connector cable (with "Messerleiste") supplies B+ to the preamp from the power amp which incorporates the power supply for both. 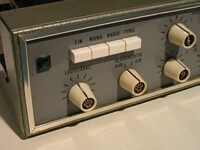 The preamp uses 2 ECC83 tubes for the RIAA preamp, 2 ECC808 in the tone control and 2 ECC83 tubes in the output section. There are a lot of filter switches and many controls (too many?) to change the frequency response. Very nice: On each knob there is a symbol that underlines its function (click on the picture to enlarge it). 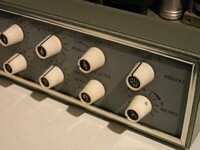 This is the later version of the same amp in its wooden cabinet. 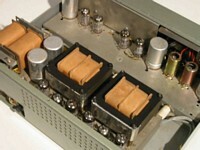 The output transformers were changed. You can see them on a picture on the EV34 site (see power amps).